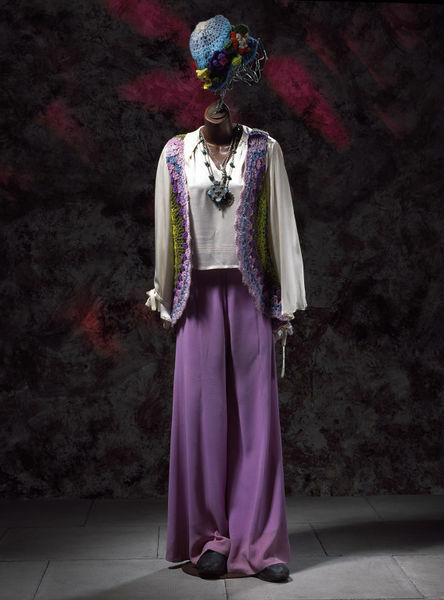 Part of an outfit (T.433 to 439-1994) worn by Shirley Abicair and donated by her to represent the 1969 Hippy in the Street Style exhibition. In the late 60s Shirley Abicair was a musician and television presenter. She loved wearing Ossie Clark's clothes and combined them with special garments made by her creative friends, such as the hat and waistcoat here. The mud stains on the trousers are from Stonehenge. Shirley Abicair sometimes painted her face with fluorescent coloured lacy designs while wearing this outfit. In the Sixties Abacair spent her time between America and England. 'I was in New York because I was writing an album there, and then I spent some time in Oregon which I loved because of the space and air. When the Sixties arrived I was in my element. I bought beautiful Twenties and Thirties clothes from the Chelsea Antique Market, and tie-dyed T-shirts and jeans from stalls in the King's Road or Carnaby Street. I had a beautiful burgundy Borsalino hat that I bought in Greenwich Village and wore everywhere and with everything. It was, in fact, my second Borsalino - I lost the first one at a Grateful Dead concert at the Phillmore West in San Francisco.'" 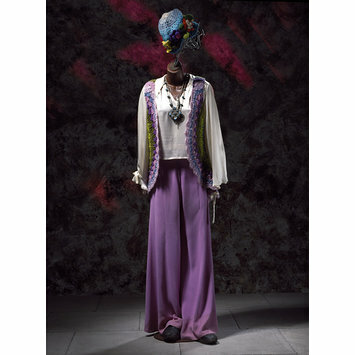 Woman's trousers, moss crêpe, designed by Ossie Clark, London, 1967-69; part of a Hippy outfit UK/USA 1969.